Cooked as curry, served as snack but called by the name of “kosambari”! Sweet Corn, which has created a niche for itself as a splendid summertime food, is a genetic variant of the maize family and is also known as Sugar Corn. It contains healthy levels of vitamin B complex and minerals, especially iron and is a rich source of fibre. Fibre helps to alleviate digestive problems and stabilize blood sugar levels. Well known for contributing to overall nourishment, especially when combined with legumes like peas, beans, nuts etc. it is a must add to everyone’s diet. Sweet Corn, true to its name, is sweet for the tooth and especially when cooked al dente, its tender outside and crispier inside makes one crave for more and more. Lime juice 1 tsp approx. Wash carrot, coriander leaves and sweet corn kernels thoroughly in water. Drain out the water and keep aside. To cook sweet corn kernels, bring water to rapid boil in a vessel. Quantity of water must be just enough for the kernels to be covered. To this rapid boiling water, add sweet corn and a pinch of sugar. Let it cook for about 5 min. Switch off the burner. To retain its sweet taste, do not overcook the kernels. Remove the steamed kernels from water and keep aside. While water is boiling (i.e., before putting sweet corn)…. Heat oil in a pan. To this add cumin seeds. When it splutters, add chopped onion, turmeric and a pinch of salt. Sauté till onions turn transparent. Now put grated carrot and resume sautéing till carrot gratings are partially cooked. Add boiled kernels, salt, chilli powder, jeera powder, coriander powder and mix them well. Switch off the flame. Garnish with fine chopped fresh coriander leaves, lime juice and a tiny blob of butter (optional). 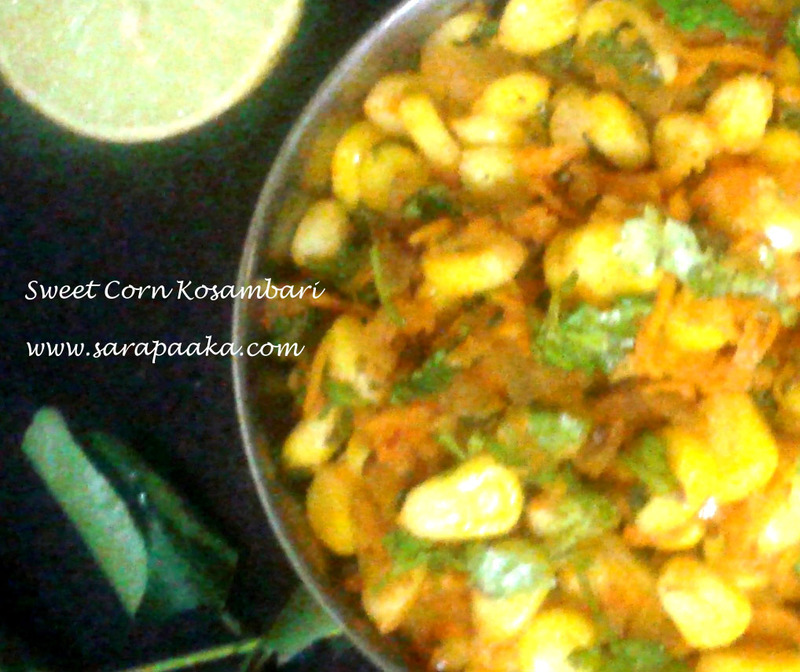 Sweet corn kosambari is ready. Serve it warm or cool. To pick fresh corn, just prick a kernel. It should squirt whitish juice. Husks should appear as fresh, tender and green like grass. Size of kernels need to be on the plumper side and spaced snug fit in the cob. Colour of corn is not a determinant of quality. Cooking corn by steaming for just the optimum time required is considered to be a healthy way of cooking since loss of nutrients is minimized to the maximum extent while still retaining its color and enhancing its taste and texture. Please do read “Sweet Corn Song” in this blog where you also get to know few other ways of using corn.